You are currently browsing the monthly archive for January 2011. Commitment is the first step families take toward participating in any congregation in ways that make it part of their emotional support system. And the primary way to express that commitment is by becoming a member. Sure there are plenty of families that are “friends” and “pledging non-members” in our congregations, and while they may receive many benefits from their involvement—worship, religious education, community—they are missing the opportunity to fully participate in their community of faith and in the Unitarian Universalist faith tradition. After all, “the use of the democratic process within our congregations” is one of our most cherished principles, and membership is the only way individuals and families can be part of that process. But perhaps more importantly, membership is an outward sign of an inward intention to make a community of faith part of the family’s emotional support system. It acknowledges the need for that emotional support, as well as the willingness to give that support to others. Simply put, without this commitment, a family is merely “going” to a Unitarian Universalist congregation. Membership is an absolute necessity for being a Unitarian Universalist family. When people think of “church,” one of the first things that comes to mind is probably “worship.” It is, without a doubt, the public face of practically every community of faith. As such, it’s entirely reasonable for families coming to a congregation to expect that they will have an opportunity to worship together, as a family. Unfortunately, Unitarian Universalist congregations do not have a long history of giving families that opportunity. For much of the past century, worship at a UU congregation was design primarily for individuals—not surprising given the history of our faith tradition and its embrace of the American notion of “rugged individualism.” But participating in a congregation in ways that make it part of a family’s emotional support system requires more than a story for all ages and an intellectually stimulating sermon. Families need as many opportunities as possible to experience the all of the elements of our worship: opening words, chalice lightings, hymns of praise and thanks, responsive readings and litanies, moments of silence, joys and concerns. Just as families should be offered multiple opportunities to worship together, so should they be given as many chances as possible to learn together, as a family. The obvious place for this to happen is a congregation’s religious education program. Rather than presenting religious education as something that is developed and administered by experts, consider approaching RE as a family affair. Find ways to involve as many parents as possible in all aspects of the program, from choosing the curricula to teaching and assisting in the classrooms. Give parents the tools they need to explore at home the lessons taught in Sunday school. Transform the Religious Education section of your congregation’s website into an interactive Family Faith Formation center where parents can find and share resources to help them with their children’s spiritual and ethical development. Perhaps most importantly, be bold and bring multigenerational faith formation experiences to the entire congregation. These experiences offer the opportunity for congregants of all ages to learn and grow together in faith. While worship and religious education are essential elements for building a religious identity in families, when it comes to participating in a congregation in ways that make it part of a family’s emotional support system, community is the key. From potlucks to congregational retreats, families need to feel at home in their community of faith. This means making sure that there are plenty of multigenerational events beyond worship and RE for families to participate in. 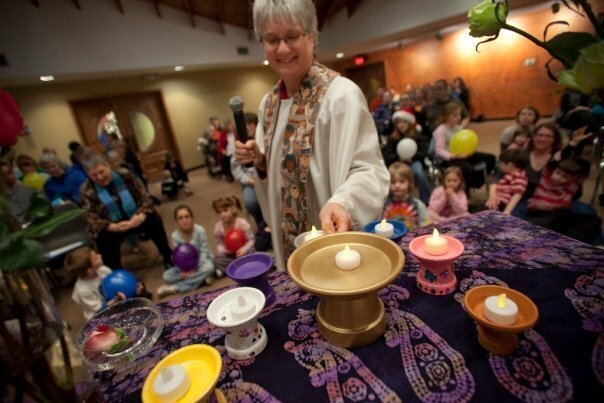 Many congregations group together a variety of activities on a single weeknight to bring people of all ages together for food, fellowship, and faith formation. These “church nights” can happen regularly throughout the year, or be limited to six to eight weeks in the fall and spring. Either way, they present the opportunity for families to experience their congregation as something more than Sunday worship and RE. Other opportunities for strengthening community include holiday parties, congregational camp outs, and gatherings with other Unitarian Universalist congregations in your area. Another way to help families participate in their community of faith as part of their emotional support system is family service. Offering families opportunities to live out their faith through service to the congregation and the larger community not only strengthens families, it strengthens their religious identity as well. In fact, family service is so important that it is considered a practice in its own right. Right now I’m unaware of any resources specifically about welcoming families with children into church membership. If you are aware of any, please let me know! Richards has taken the worry out of planning children’s worship and replaced it with wisdom and joy. From setting worship goals, to choosing child friendly-hymns, to finding stories that illustrate our Principles, Come Into the Circle is a resource I’ll be turning to again and again. For a classic answer to the question, “What should the Sunday morning experience include for children?”, see this response from DRE Mary Marsh in the October 1999 issue of Interconnections. Many of the things Marsh would like to see could, and should, happen during a worship experience shared by families. The Worship Web at uua.org also has a list of resources for Multigenerational Worship. Don’t forget the Family Pages in every issue of the UU World. They contain a wealth of ideas for topics and stories that can be used in family worship settings. A variety of other resources are also available from their website: www.lifelongfaith.com. The UUA’s curricula series, Tapestry of Faith, has a multigenerational program that teaches stewardship with a focus on water called Gather the Spirit. Here’s an article on Multigenerational Community from the Rev. Linda Olson Peebles on the uua.org website. For resources on how congregations can help families serve the community together, the upcoming post on Family Service, scheduled for Wednesday, February 2, 2011. Last Sunday I shared a small group ministry session on the theme of Hope as a spiritual practice. Here’s another session in the same series. This time, Hospitality. Hospitality is the virtue which allows us to break through the narrowness of our own fears and to open our houses to the stranger, with the intuition that salvation comes to us in the form of a tired traveler. Hospitality makes anxious disciples into powerful witnesses, makes suspicious owners into generous givers, and makes close-minded sectarians into interested recipients of new ideas and insights. The church plays a central role in the community life of the small town in this movie fable. It stands for tradition, for the way things have always been, and especially during the season of Lent when this story takes place, for self-restraint and sacrifice. At least that’s the way the town’s mayor sees it, and he’s making sure the priest says as much from the pulpit. Just five weeks on the job, Pere Henri is young and inexperienced, so he preaches sermons the mayor has edited about the dangers of temptation, the threat to morality posed by outsiders, and even the evils of chocolate. That’s as fine a summary of the Gospel message as we’ve heard in a long time. Questions: Tell a story about an encounter with another religion — a conversation with a believer, a visit to a sacred site, attendance at a ritual, or use of a practice — and what you learned from the experience. Hospitality is essential to spiritual practice. It reminds you that you are part of a greater whole . . . Putting others first puts you in the midst of life without the illusion of being the center of life. To Practice This Thought: Be a welcoming presence by humbling yourself. Group Session Plan based on resources on Hospitality from www.spiritualityandpractice.com. For a PDF version of this small group ministry session, click here: Hospitality. For more information on small group ministry, visit the UU Small Group Ministry Network. When it comes to holidays, the important thing is to help families celebrate them in ways that the religious significance comes through. What that religious significance actually is can vary from family to family and from congregation to congregation. What doesn’t vary, however, are the methods congregations can use to assist families plan their holiday celebrations. When it comes to celebrating holidays in Unitarian Universalist households, the difficulty is found not so much in the how, but in the why. The inquisitive attitude embodied in the questions traditionally asked by the youngest child during a Passover Seder could apply to almost any religious celebration. Why do we celebrate this holiday? Preparing parents to answer that question may be the most helpful thing a congregation can do. Offering Unitarian Universalist talking points based on the Six Sources is a good place to start. These talking points can be posted on the Family Page of a congregation’s website; they can be sent home to families as part of the religious education program; and they can be talked about from the pulpit during worship services. Ideally, these talking points would be a combination of historical information about the holiday and a variety of Unitarian Universalist interpretations based on the Six Sources. Helping families celebrate holidays with meaningful rituals is another way congregations can make sure the religious significance comes through. And there are plenty of amazing Unitarian Universalist resources available on rituals and traditions. Again, the important thing is to make these resources available to families in a variety of ways. Web resources, Sunday school handouts, suggestions from the pulpit—families can never get too much information about celebrating holidays in religiously significant ways. There are a growing number of Unitarian Universalists who have felt the need to create and celebrate holidays specifically for our tradition, like Chalica and Sources Suppers. These new celebrations are in addition to some of the popular traditions already observed by many congregation, such as Water Communion and Flower Communion. How much emphasis individual congregations place on these celebrations varies. The important thing is to make sure families have the resources they need to understand why a particular celebration is being observed. For resources about the Six Sources of Unitarian Universalism, see my post on Caring Conversations. For an excellent example of how to interpret winter holidays from a Unitarian Universalist perspective, see “‘Tis the Season for Your Own Family Rituals,” an article by Meg Cox in the Winter 2005 of the UU World. An wonderful resource from the UUA Bookstore on family rituals: How to Bury a Goldfish: And Other Ceremonies and Celebrations for Everyday Life. For a brief introduction how Unitarian Universalist celebrate holidays, including Flower Communion and Water Ceremony/Communion see “Holidays” on the uua.org website. Chalica, New Weeklong UU Holiday, Slowly Gains Adherents. To find out more about the Sources Supper, visit the Unity Church-Unitarian website: The Sources Supper: A Celebration of Our Unitarian Universalist Heritage. Numerous sources have identified conversations between parents and children as one of the most important ways to strengthen family ties. When parents make a practice of genuinely listening to their children with respect and care, the children learn they can talk freely about what matters most in their lives. Not surprisingly, morality and spirituality are bound to come up as topics for conversation from time to time. Not all Unitarian Universalist parents feel they are well-versed enough in our faith tradition to confidently talk about issues such as God, faith, and religion from a liberal religious perspective. Congregations can prepare parents for these conversations in a number of different ways. Obviously, not all Unitarian Universalist families think alike. However, as Francis David, one of our Unitarian Universalist forebears said, “We need not think alike to love alike.” Fortunately for Unitarian Universalists, there are a lot of different ways of thinking (and talking) about God, faith, and religion that fit under our liberal religious umbrella. These different ways are perhaps best expressed in the six sources of our faith: mystery and wonder, inspiring people, world religions, Jewish and Christian teachings, reason and science, and our sacred Earth. Unitarian Universalist parents will most likely gravitate toward one or two of these sources as the basis for their own personal beliefs. And when they openly and honestly share those beliefs with their children through caring conversations, they are inevitably sharing something about the heart of Unitarian Universalism. One way to increase the faith forming power of any of these seven practices is to put two of them together—having a caring conversation at the dinner table, for example. There are plenty of resources available to help families get conversations going at mealtime. Congregations can help with that process by offering specifically Unitarian Universalist conversation starters to their families. Another good opportunity for parents to have conversations with their children about what matters most in life is bedtime. Talking with children about the joys and worries of the day can be a natural part of any bedtime routine. And approaching those joys and worries from a Unitarian Universalist perspective is wonderful way to for families to bring their faith home. Welcome: A Unitarian Universalist Primer, now available as an e-book, too. Sunday and Every Day: My Little Book of Unitarian Universalism, another good resource, available as an e-book as well. Another good web resource is Dinner Conversations with Kids. Lots of good ideas, like 100 Questions to Ask Your Kids. See the resources for my previous post on Bedtime Rituals. There’s something about the end of the day that lends itself to ritual. Maybe our minds harbor collective memories of the primal dangers of the night. Or perhaps it’s because each goodnight kiss foreshadows that final farewell we all, inevitably, must face. Whatever the reason, there seems to be a deep human need to bring some sort of order to the end of each day. Bedtime rituals do just that. And as with any ritual, it’s relatively easy to add a few elements that tie together a family’s daily life with their Unitarian Universalist faith. The list of benefits children receive when their parents read to them on a regular basis is almost as long as the benefits of sharing family meals (another of the seven tools). Storytime is a natural bonding experience that lets children know that they are an important part of their parents’ lives. It helps children become lifelong readers and paves the way for academic success. And perhaps most importantly for faith formation, it expands their horizons, exposes them to novel situations, and teaches them appropriate behavior. In recent years the Unitarian Universalist Association has developed a number of storytime resources for families to use. Congregations can help families by stocking their bookstall with storytime resources for the UUA. While not every family will feel comfortable with the notion of bedtime prayers, taking the time to express one’s gratitude for life’s blessings and share one’s hopes for tomorrow is wonderful way to close the day. Fortunately, there are a variety of ways this can be done. In addition to the more traditional prayers addressed to a loving God or Goddess or Spirit, there are other more secular formulas that allow children to give thanks and acknowledge their love and care for family and friends. Either way, such moments are obvious opportunities to strengthen a family’s religious identity. Once again, the Unitarian Universalist Association has developed a number of resources for doing just that. Bedtime, like dinnertime, offers the chance for parents and children to have caring conversations about what matters most in life. It can also be the perfect time to give children the opportunity to share the joys and worries of their day. And as with any conversation between parents and children, these moments may also provide occasions to reflect on a family’s Unitarian Universalist faith. An article from parenting.com offering “4 Tips for Making Bedtime Conversation a Ritual” that can easily be adapted to include UU themes. UU World Family Pages provide a variety of stories and topics for conversation. Dale Wilt Evans on To Life! Series on Staffing for Diversity This series of articles originally appeared in the August 2017 through January 2018 editions of Compensation and Staffing News, a monthly Office of Church Staff Finances publication. Continue reading Staffing for Diversity. This blog post comes from Rev. Dave Dunn of the UU Metro Atlanta North Congregation in Roswell, GA. Continue reading Love Resists By Building from the Ground Up. Rachel Mize Finding myself on the Camino de Santiago. Theresa I. Soto no one can rename you Other, it can’t stick, as you offer the gift of being and saying who you are. Elaine McArdle Young Unitarian Universalists helped organize student walkouts in several cities on March 15 to demand action on climate change.